There were no live break-ins for the news conference. No record-setting Twitter chatter. No rabid fans taking the streets, wondering what life will be like going forward. But a bombshell was dropped on the world of professional bull riding on Thursday: The Michael Jordan of bulls is retiring. 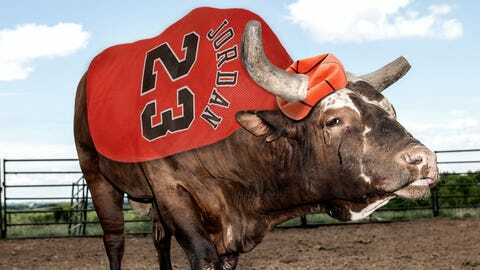 No, not the Michael Jordan of bull riders. And not the Michael Jordan who played for the Bulls. The Michael Jordan of bulls. Bushwacker will retire at the end of the Professional Bull Riders season. Bushwacker’s owner, Julio Moreno, said Thursday he wants the 8-year-old bull to retire on top. Bushwacker will face the most recent cowboy to successfully ride him â reigning world champion J.B. Mauney â Saturday in Oklahoma City. Mauney’s 8-second ride in August in Tulsa ended Bushwacker’s streak of 42 consecutive buck-offs dating to 2009. Moreno, who says Bushwacker is to bulls what Michael Jordan was to basketball, admitted Mauney’s fearless approach always gives him a chance. As No. 1 in their respective ranks, they will meet for the 12th time. Bushwacker will make his final appearance Oct. 22-26 in the world championships in Las Vegas.